One of Dudley Holland's favourite models. Male Portrait, oil on board. Dudley Holland 1915 - 1956. Painter, muralist, designer, printmaker and teacher, educated at Kingston Grammar School, Chelsea, and Willesden School of Art. He was awarded an exhibition to the Royal College of Art, 1936, which he refused, preferring to paint on his own. He taught design, painting and drawing at Willesden, Harrow and Goldsmiths and was appointed principal of York School of Art in 1949, and Guildford School of Arts and Crafts in 1951. His mural commissions included decorations for Cunard Line, as well as schools and libraries. 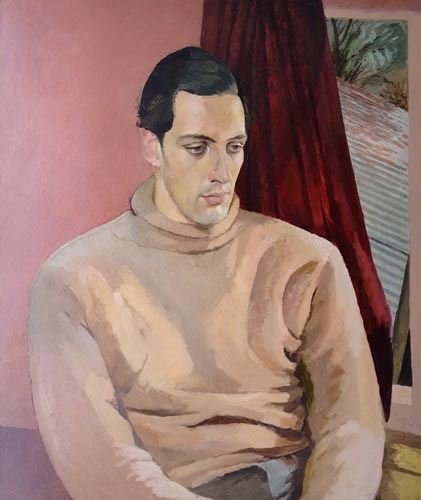 He exhibited at the RA from 1937, also with NEAC, LG and Redfern Gallery and in touring shows. 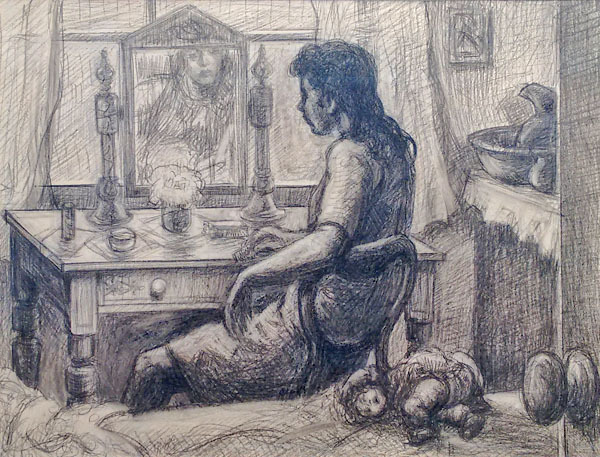 In 1950 he shared an exhibition with Austin Wright at York City Art Gallery, which holds his work, as does the Arts Council. Holland was killed in a road accident in 1956.